A load of rubbish? 232.618 entered Irrenlohe with freight 56900, the 08:37 Nürnberg Rbf - Schwandorf, on 24 April 2013. The train consisted mainly of loaded domestic waste containers going to the incinerator at Schwandorf. Having done very well on this line last year, I only paid a couple of very brief visits this time, spending Monday afternoon near Etzelwang and paying a quick visit to Irrenlohe on Wednesday morning. There have been some changes on the passenger side this year. The ALEX trains that used to run between Praha and Nürnberg now run to and from München instead so there are no longer any loco hauled passengers on the Schwandorf line. DB have switched their DMU fleet around as well. The class 610 DMUs that used to work the bulk of the trains have almost vanished and the vast majority of services are now operated by class 612s. The freights seen followed the same pattern as last year with the two regular afternoon westbounds seen on the Monday and one morning eastbound observed on the Wednesday, all hauled by class 232 or 233 diesels. There was also a westbound stone train early on the Monday afternoon, also 232 hauled. Poor light scuppered any chance of getting good pictures on the Monday but the morning 232 hauled freight was successfully photographed on the Wednesday. 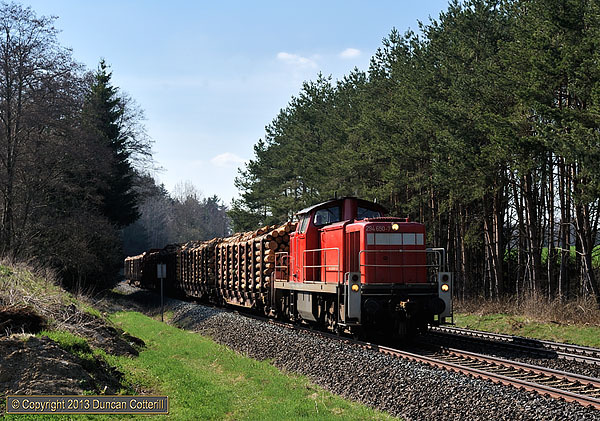 Pegnitztal is a great place to photograph Ludmillas on freight trains, if you can find any. The afternoon freight from Cheb was one of the more reliable runners and is pictured here behind 232.618, crossing the river for the umpteenth time at Enzendorf, between Vorra and Rupprechtstegen, on 25 April 2013. Spring was only just making its presence felt in the valley at the end of April with the first trees coming into leaf, adding a welcome splash of green to the rich browns of the landscape. My main reason for being in the Nürnberg Area was to spend more time photographing diesel hauled freights on this scenic line in north-eastern Bavaria. There haven’t been any loco hauled passengers on the line for a few years and, like the Schwandorf line, DB class 612 DMUs are squeezing out the remaining class 610s. No 610s were seen over the four days I spent on the line. All the RE and IRE services were worked by class 612s with DB class 648s on RB services between Nürnberg and Neuhaus(Pegnitz) and class 650 railcars operated by Agilis on Hof – Kirchenlaibach locals. All the freights seen were worked by DB class 232 and 233 diesels as expected, usually single locos but occasionally double-headed. Traffic always used to vary a bit from day to day but there was a definite pattern this time round line. Unfortunately two of the most reliable workings in previous years, a car train from Kolin, in the Czech Republic, to various destinations in France and the lunchtime Nürnberg - Cheb freight, didn’t appear to run at all during my stay. This left a very long gap between three early morning freights, a Zwickau – Nürnberg, a Cheb – Nürnberg and a Nürnberg – Cheb, and the afternoon Cheb – Nürnberg. All these services ran reliably but the trains were rather short on occasions. The early Nürnberg – Cheb consistently ran around an hour late on all three days I saw it and was also double headed every time. Although it was of little consequence photographically, the proportion of trains worked by class 233s seemed to be much higher than on my previous visits. Freight times on all the lines east of Nürnberg were obtained from http://www.cargonautus.de but note that the timetables include historic schedules as well as those currently in force. Having covered the Nürnberg end of the line reasonably well on previous visits, I was keen to spend more time at the north end on this trip. I did indeed spend more time there but it was fairly unproductive due to the lack of traffic in the middle of the day. At least the weather was generally good and most of the freights that did run produced good photographs, even if many of them were towards the southern end of the line. Early mornings are a good time to find freights on the Nürnberg - Marktredwitz line. A very smart 233.367 approached Neuhaus(Pegnitz) with train 51683, the 04:51 from Zwickau to Nürnberg Rbf on 26 April 2013, one of three freights to pass between 07:30 and 08:30 that morning. After that, nothing was expected until mid afternoon. It's often possible to identify freights by "reading" the wagons. It's just common sense really. Cheb trains usually contain Czech wagons while the Zwickau will usually have some car carriers loaded with new Volkswagens from the plant there. As well as the long distance freights, the network of lines north-east of Nürnberg also hosts a number of trip workings feeding local industries. Wiesau, 18km south of Marktredwitz on the Schwandorf line, is served by a couple of workings every weekday, usually hauled by DB class 294 diesels. 294.650 emerged from the woods at Pechbrunn with the afternoon Marktredwitz - Wiesau trip on 24 April 2013. A couple of brief visits were paid to this line during anticipated lulls in traffic on the Nürnberg - Hof line. I spent an hour or so in mid morning at Irrenlohe, junction of the Marktredwitz and Nürnberg lines, north of Schwandorf, and a couple of hours at Pechbrunn, south of Marktredwitz, in the late afternoon. The main attractions on this line are the ALEX services between München and Hof, worked by class 223 diesels north of Regensburg and running to a basic 2-hourly pattern with some gaps. DB also operate a few RE services between Hof and Regensburg, filling the gaps in the ALEX pattern and providing additional trains in the peaks. These trains were worked by the elusive DB class 610 DMUs. Local services were in the hands of Vogtlandbahn class 642 DMUs. The Regensburg – Marktredwitz line sees little through freight traffic but there are a number of 294 worked local freights around Marktredwitz, Weiden and Schwandorf. Two of these were seen, a morning Nabburg – Schwandorf trip at Irrenlohe and an afternoon Marktredwitz – Wiesau and return trip at Pechbrunn, both running a little earlier than predicted by cargonautus. The most intriguing working left Irrenlohe just as I arrived around 10:00, consisting of a class 225 (or similar) hauling a train of hoppers northwards up the Marktredwitz line. The wagons were very similar to those seen on the stone train at Etzelwang on the Monday afternoon and, judging by the shunting staff riding on the wagons, they weren’t going very far. I left before they came back so didn’t manage to identify the loco or the destination. A few good shots were obtained in generally sunny weather but that has only scratched the surface. The line has considerable photographic potential, running through attractive countryside with semaphore signals at a number of stations. While the ALEX services are worth photographing, they don’t really justify spending a lot of time on the line. What it needs is more through freight traffic and that will happen from 1 June to 3 November this year when freights that normally run from Marktredwitz to Nürnberg via Kirchenlaibach and Pegnitz are diverted via Weiden and Neukirchen, using the northern part of the Marktredwitz – Regensburg line in the process. Cargonautus has the details. ALEX services from München to Hof are the only loco hauled passenger trains to penetrate the far north-eastern corner of Bavaria and run with an unusual mixture of double and single deck stock. 223.062 was in charge of ALX84110, the 14:44 from München Hbf to Hof Hbf, seen here passing Pechbrunn almost exactly three hours into its three and a half hour, 317km journey. The first 138km section, from München to Regensburg would have been worked by one of ALEX's class 183 electrics, with the class 223 taking over for the 179km unelectrified section north to Hof. DB Fernverkehr hires a small number of class 182s from MRCE Dispolok for use on long distance services. Among the trains they work is IC2082, the 08:35 from Berchtesgaden Hbf to Hamburg-Altona, which also conveys a portion from Oberstdorf, attached at Augsburg. The train is unusual in not calling at München Hbf, presumably to avoid the complication of a reversal there. 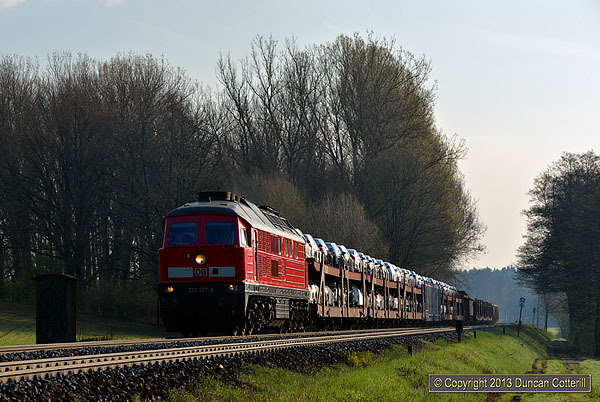 182.509 was photographed hauling the combined train through Möhrenbachtal, south of Treuchtlingen on 26 April 2013. I’d always intended a brief visit to this line to try a shot of the 103 on it’s Friday afternoon trip from München to Nürnberg. However a lack of daytime freight traffic on the Nürnberg – Hof line prompted me to spend most of the day there, mainly in the Möhrenberg area, just south of Treuchtlingen. InterCity services over the line are relatively frequent but operate to a fairly erratic pattern with long gaps at times. Many services are operated by ICEs, with classes 401, 402 and 411 all seen. A number of loco worked IC services were also seen, mainly hauled or propelled by class 101s, but including IC2082 and IC2083 with MRCE Dispolok class 182s and IC2206 with 103.245. 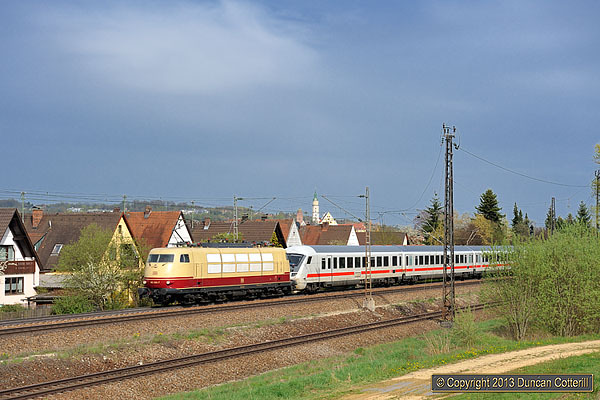 RE services operate hourly south of Treuchtlingen, alternating between Nürnberg – Augsburg trains worked by class 111s at the north end of double-deck push-pull sets and Treuchtlingen – München trains worked by DB class 440 EMUs. More trains run north of Treuchtlingen and south of Donauwörth but weren’t seen. Nine freights were seen in around five hours by the lineside, worked by locos of classes 151, 152, 182, 185 and 189 with the 185s working almost 50%. Only two trains were worked by independent operators’ locos, a Dispolok 182 and a Railpool 185. Unlike the other lines covered on in this report, I hadn’t really done much research into potential photo positions on this line but remembered that it headed through a range of hills south of Treuchtlingen, so that’s where I headed. It turned out to be a good choice with a couple of reasonable spots quickly found. The spot I’d identified for the 103 from Google Maps turned out to be less than ideal as it went into shadow shortly before the train was due and I had to find another position in a hurry. This is a busy line with plenty of variety, a fair amount of freight and some good locations, making it worth another visit in the future. The last time I photographed a class 103 on a scheduled passenger service was in 2002, just before the class lost all its main line work. It seems incredible that it's possible to see a class 103 working InterCity passengers on a daily basis in 2013, eleven years later. 103.245 accelerated late running IC2206, the 15:39 from München Hbf to Nürnberg Hbf away from Donauwörth on 26 April 2013. The 103s are still DB's most powerful locomotives and 245 was putting its great power to good use making up lost time.